Cogmed - Dr. Vicki Veroff, Ph .D. Cogmed Working Memory Training is a five- to seven-week, home-based computerized intervention proven to reliably improve attention, impulse control, working memory and ADHD symptoms in both children and adults. Improvements in reading comprehension and math problem-solving have also been shown. Benefits have been found in populations with ADHD, high functioning Autism Spectrum Disorder, Down Syndrome, stroke, traumatic brain injury and the normal cognitive decline associated with aging. Cogmed comes in three versions, for preschoolers, children/teens and adults. 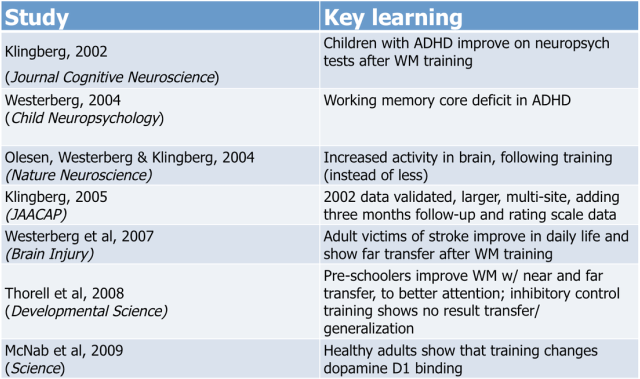 Developed by a well-respected cognitive neuroscientist, Cogmed Working Memory Training is based on principles of neuroplasticity, which basically means flexibility in the brain. 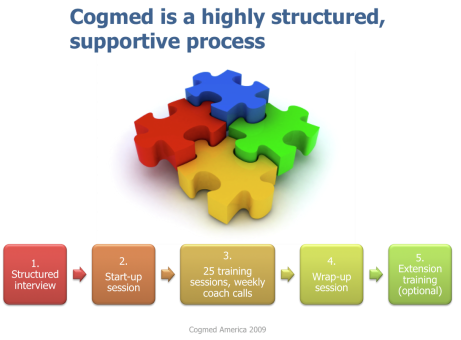 It is individually tailored to the user, so our level of performance is continually increasing, and every training session is monitored by a licensed Cogmed Coach, who provides weekly phone support. The results are both exciting and indisputable: 80% of users show noticeable improvements in functioning! 1. Structured Interview - Whether you have been referred for Cogmed by a psychologist or medical doctor, or would just like to improve your working memory and attention, we will have a brief telephone interview to make sure Cogmed is right for you. 2. Start-up Session - Before beginning Cogmed Working Memory Training, we will have a one-hour meeting during which pre-testing will be done (brief measures of working memory plus questionnaires on general functioning). The Cogmed program will be explained and demonstrated, and coaching calls will be scheduled. Rewards for completing the program will also be planned. 3. Training - Individuals are asked to do Cogmed Working Memory Training four to five times per week for five to seven weeks. Sessions for older children and adults take anywhere from 30 to 50 minutes; Cogmed JM sessions for preschoolers take about 15 to 20 minutes. Sessions should be done in a quiet environment without interruption, although breaks can be taken. Users will need a computer or tablet with internet access; an external mouse is helpful but not necessary, and headphones may be useful if distractions are inevitable. A qualified Cogmed coach will monitor progress online and get in touch weekly to offer support and suggestions. Note that users can monitor their own progress online if desired. 4. Wrap-up Session - Approximately one month after training is done, a follow-up session will be held to do post-testing and summarize training results. A summary report will be provided. 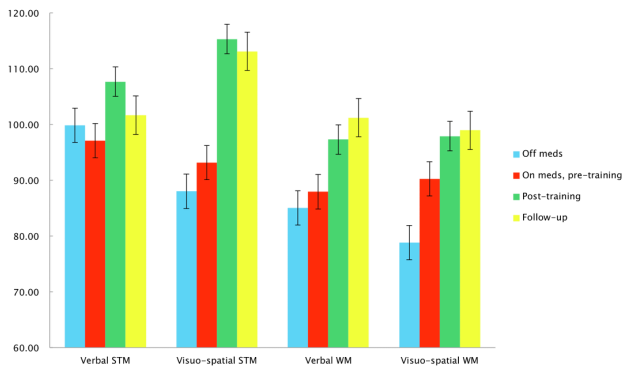 Note that users are contacted by phone or email six months later to check on progress. 5. Extension Training- All Cogmed users are entitled to one year of mini-training sessions following the five-week training period. This extension training can be activated at any time. Although results will still be posted online, there is no formal coaching for extension sessions. Users can also purchase additional training sessions (at a reduced rate) after the extension period is over. 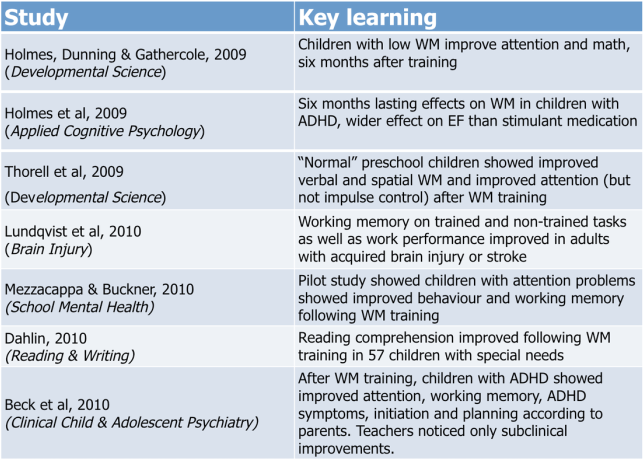 Holmes et al (2009) Chart of improvements in short-term and working memory before medication, after medication, after WM training and at follow-up.